“Tonight the Great Pumpkin will rise out of the pumpkin patch. He flies through the air and brings toys to all the children of the world.” Well, he has arrived in Cambridge, MA, kiddandos, and the toy is sweet pumpkiny dessert in a glass. Pouring a sparkling amber, this ale smells richly of dense pumpkins, strips of caramel, and ample cinnamon. 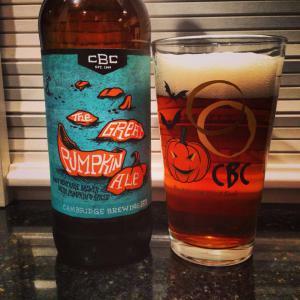 There is no shyness to the quantity of sugar pumpkins in this ale, but they balance amongst a raft of caramel, and create a buttery smoothness enhanced with vanilla and edged up with cinnamon. Just before the passing of a confectionary point of no return, a touch of bitter hops whisks the Great Pumpkin away as he has noble work elsewhere to do.